Review by AllTheBestFights.com: 2016-03-26, fight not particularly good between Luke Campbell and Gary Sykes: it gets two stars. The 2012 Olympic bantamweight gold medalist Luke Campbell entered this fight with a professional record of 12-1-0 (10 KOs=83%) and he is ranked as the No.33 lightweight in the world but he comes off his first loss, suffered against Yvan Mendy last year (=Campbell vs Mendy). His opponent, Gary Sykes, has a boxing record of 28-4-0 (6 knockouts) and he suffered his last loss in 2014, against Liam Walsh (=Sykes vs Walsh), after this bout he beat Ibrar Riyaz. 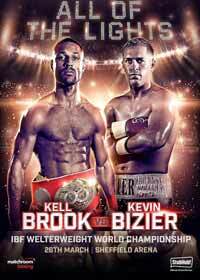 Campbell vs Sykes is valid for the vacant Commonwealth (British Empire) lightweight title; undercard of Kell Brook vs Kevin Bizier. Watch the video and rate this fight!